There is no set limit (other than memory) on the number of views that Flapjack can contain. To create a new view, use the Create New View dialog accessible via the View->Create new view menubar option. 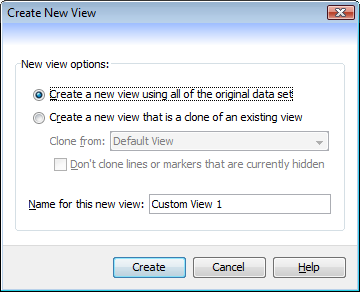 Create a new view using all of the original data set - selecting this option will create a new view that contains all of the data that was originally imported into Flapjack. The lines and markers will be shown in the same order that the underlying data contains them in. Create a new view that is a clone of an existing view - selecting this option will create a new view that is a clone of one of the existing views that may already exist. It will be an exact copy of that view, with the same colour scheme, line order, marker order, selection states, etc. You also have the option to exclude any hidden lines or markers from the new view - they will not be cloned, and therefore cannot be restored to the new view at a later time. With either option, you can also provide a custom name for the new view.